A. Our address is 4024 Alexandra Drive. We are located next to Kirk Gross Company and FedEx. A. Bleed is a printing term that is used to describe a document which has images or elements that touch the edge of the page, extending beyond the trim, edge and leaving no white margin. When a document has bleed, it must be printed on a larger sheet of paper and then trimmed down. Q. Where does the mailing panel go? A. The mailing panel is located in the bottom right corner of your postcard. Download a handy template to guide you. Q. The pre-press department told me my paneling is off... what does that mean? A. "Paneling" is another term for panel sizing. Depending on the type of fold, the panel sizes will have to decrease to fold correctly on our mechanical folder. Roll folds, like that on a standard 8.5x11 trifold require paneling to fold. See the example here, or download a template. Q. What does low-res mean? A. Low-res or low resolution, commonly refers to the quality of the image being used. More specifically it refers to how many dots are comprised to represent the image. dpi is the acronym for "dots per inch". To print a clear image, we recommend a resolution of 300-600dpi. 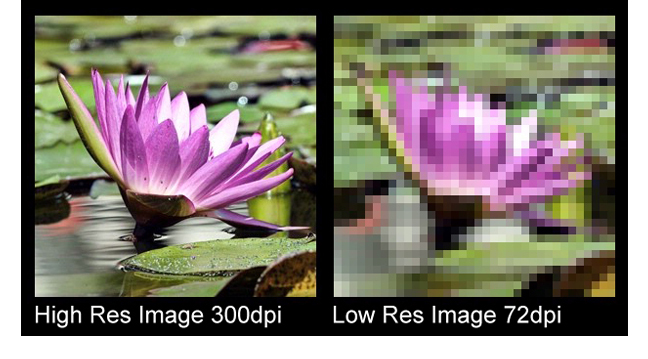 If an image is below 250dpi, the visual quality of the image begins to diminish. Q. What happens if we have a low-res image? A. Our pre-press technicians always perform a preflight check, which includes checking for image resolution. If we find an issue with the resolution of images we stop production and contact our customer; offering you the opportunity to exchange the picture or approve as is. Q. Can I make an edit to a file after it's approved? A. If you ever need to hold a file after it is approved, email [email protected] We will pull it from the schedule to keep it from being printed. Edits post-approval may be subject to additional fees or surcharges depending on where in the process it is. Projects that have been printed will usually be considered a Reprint and charged accordingly. Q. I need to make an edit to the art, I just noticed it when looking at the proof. What should I do? A. If you need to edit your art and resend, we ALWAYS ask that you inform us of the change. It may be easier for us to make the change in house rather then preflight new art. We also need to confirm that we have the correct art file being sent to press. Didn't find what you need? Email [email protected] to connect with your Customer Service Representative.